We have a varied selection of safety barrier that you can purchase online, if you are looking to protect an area and keep people on foot safe our barriers are the ideal solution. What types of safety and pedestrian barriers do we stock? 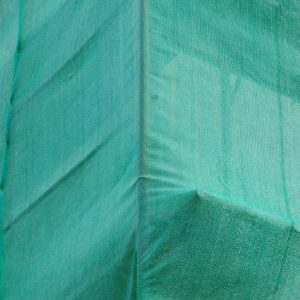 We offer 3 different types of barrier that are made from high quality materials, that are safety assured and built to last and are very cost effective. All of our temporary and safety barriers are extremely easy to store and assemble. We also supply various accessories to work alongside our plastic and galvanised steel barriers however if you require an accessory product, we do not have listed on our site please call or email us to see if we are able to obtain it for you. We currently offer three types of safety barrier. You will find details below of what they are and do and how they differ to one another other. 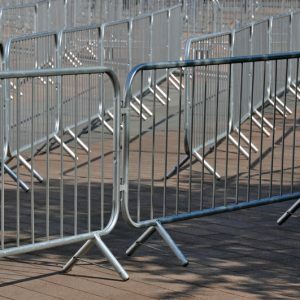 These crowd safe barriers are quick and easy to put together and have been manufactured with safety and security in mind to ensure these barriers offer the highest protection, this is why they have been rigorously tested to British standards. This particular crowd barrier offers excellent value for money and is a popular choice for creating a safe access area for pedestrians. Additional extras can also be purchased to work alongside the barrier itself which include the crowd walkway barrier. The plastic pedestrian barriers are another popular purchase for any contractor or trade who needs to build a safe perimeter around a highway where pedestrians and vehicles can come into contact. We have various heights available for the safe pedestrian barriers, but the most common size is the 2-metre-wide by 1 metre high barrier. They are made from polyethylene plastic which is hard wearing, long lasting and weather resistant and they also have high visibility reflectiveness, for increased vision to ensure on coming vehicles can clearly see the barricade. They have non-trip feet and easy and secure lockable connectors creating a safe walkway or barricade for people on foot. Our pedestrian barriers are compliant with the Chapter 8 code of practice. This barrier is now a very popular choice for road side pedestrians and vehicle crash safety. The water filled traffic separator barriers are extremely safe, versatile and reliable. This type of safety barrier offers fast deployment with the highest degree of protection for both people on foot and road users. These are also highly visible, stackable and have interlocking feet. 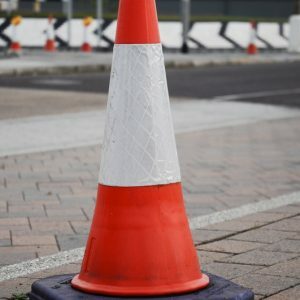 Important information for any contractor working around pedestrians? It is a government regulation that anyone working in a public area should establish and maintain safe areas of work for all temporary works. The Highways authority and statutory undertakers must ensure they pay close attention to detailed traffic management arrangements when working road side or working in and around a pedestrian footway or an area where a person on foot may enter your work space. What is Chapter 8 street works code of practice? This has been issued by the secretary of state for transport and is a manual of traffic safety measures for temporary street and road works in which everyone working in such temporary situations must adhere to this code of practice. If you need something in a hurry please do call us and we will endeavour to get your safety barrier order delivered to you asap. Our current lead time is 1-4 working days but this does depend on if we have received cleared funds and how many delivery slots are available. To find out how much delivery will cost please let us know what safety barrier products you are wanting to purchase, how many you require and finally your delivery address and postcode. Please note at this time we do not offer a collection service. What is the minimum order quantity for your barricades to qualify for delivery? This all depends on what items you are wanting to buy and also the quantity you need, each item we have listed under our safety barrier category will have their own individual minimum quantity. If you are purchasing more that one type of barrier then please contact us for clarification.